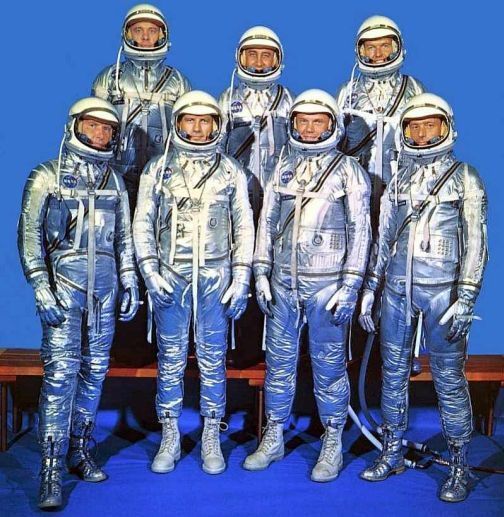 The Mercury 7 astronauts. Who will replace them in the 21st century? Photo by NASA. Growing up in the 1960s, it was easy to spot the American heroes of the Space Age. Alan Shepard was the first to strap himself onto a rocket and blast into space. John Glenn followed him around the earth, and the parade continued until sometime in the 1980s, when the only astronauts that entered the public consciousness were the ones who died in the Challenger and Columbia accidents. After Sally Ride, astronauts became a commodity, as ordinary as truck drivers or airline pilots. America has no one in the astronaut corp that can wear the title of “hero,” at least in the same way Neil Armstrong could. The Space Shuttle stopped flying in 2011, and no, the astronauts on the International Space Station are not heroes. They are courageous people, to be sure, but they travel a well-worn path. The word “hero” is thrown around too easily; I don’t subscribe to the idea of firefighters, police officers or most members of the military as heroes. We pay them to take risks, sometimes with their lives, which they do willingly, and although they often perform amazing deeds and sacrifice much for us, they rarely reach the level of humans walking on the Moon. Who can replace astronauts as heroes, at least before we send the first manned expedition to Mars, an asteroid, or even the Moon again? In the past generation, we’ve turned to entrepreneurs to emulate and idolize, especially the tech entrepreneurs, the Bill Gates, Steve Jobs, and Larry Ellisons of the marketplace. Americans have lionized a sub-group of these (almost always) men, starting with Benjamin Franklin and including Thomas Edison and Jonas Salk. They combine entrepreneurship with innovation and intellectual risk-taking. In the realm of space exploration , names such as Elon Musk and Richard Branson come to mind. Some might include Jeff Bezos and Paul Allen. An expansive view would include a woman, Jane Poynter. Are these men (and a few women) heroes of the seventh decade of the Space Age? They’re risking their fortunes, their reputations, but not their necks, in the same way Yuri Gargarin and Valentina Tereshkova put everything on the line for their country or for an ideal. High-profile entrepreneurs may lose their shirts, but not their lives, as cosmonauts and astronauts have since Russian Vladimir Komarov became the first human to die on a space mission in 1967. The prospect of death may be a prerequisite for heroism. Before we launch someone to Mars, we may have to settle for finding people to admire and emulate, if not to lionize. I find myself admiring Elon Musk, but not the other titans of the current space economy. Of all these entrepreneurs, he is actually making something happen. His company SpaceX is a pioneer in making space more accessible to more people, if not the masses, then at least more than the lucky few who can pass a NASA physical. I also like his apparent humility and quiet manner in public. His lack of showmanship and slavery to the cold logic of the marketplace make him an anti-Richard Branson or anti-Jeff Bezos, refreshing in a world that values surface over substance. Is Elon Musk a hero? No. It’s unlikely he’ll strap himself into a Dragon capsule on top of a Falcon rocket. If he did, it would be nothing more than a stunt. One of the SpaceX astronauts who does, however, may qualify. He or she may even be in the vanguard of a new era of the Space Age. If we’re very lucky, their names will become as immortal as Armstrong, Aldrin, and Collins.